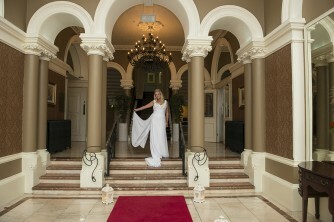 Ballymascanlon House Hotel is located in Dundalk, Co Louth. A beautiful victorian house surrounded by landscaped gardens and an 18 hole golf course. The original house is stone which is a very attractive backdrop for some photos especially at the main entrance door. For those who want more contemporary photos, the new glass section entrance is super for photos too, with the red carpet following up the steps. For some outdoor photos, the tree lined driveway and gardens which are full of colour during the summer. Even in the winter,the cute clock tower deserves a shot. Inside the hotel, everyone wants a photo with the unusual circular staircase and the main banqueting room is bright and full of glass which allows views of the outside gardens for some daylight pics too. 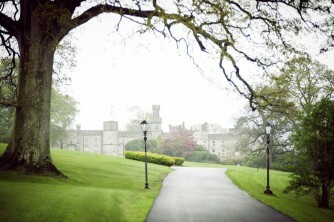 Cabra Castle is a 19 th century four star castle hotel in the Cavan countryside. The outside has beautiful gardens with a splendid castle entrance where you can have your photo taken with a real wolfhound! The interior is very castle like with antiques, paarcing a, arched doorways, chandeliers, and an amazing staircase with latticed window. The rooms upstairs are super for photos with artefacts and period furniture. They now boast a fancy bridal suite with free standing Victorian bath. 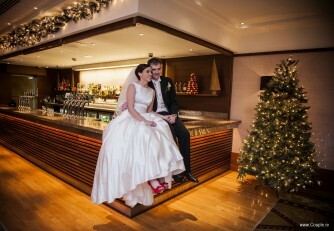 All the comforts for a bride and groom!